Roadmap to Success is a series of posts designed to help learners better understand certification pathways, career opportunities associated with those certifications, and next steps beyond certification. The MCSA: Office 365 continues to gain popularity and momentum across every industry. As an ever-growing number of organizations adopt Microsoft Office 365 to meet their business collaboration needs, the need for IT pros who can effectively administer the product has skyrocketed. 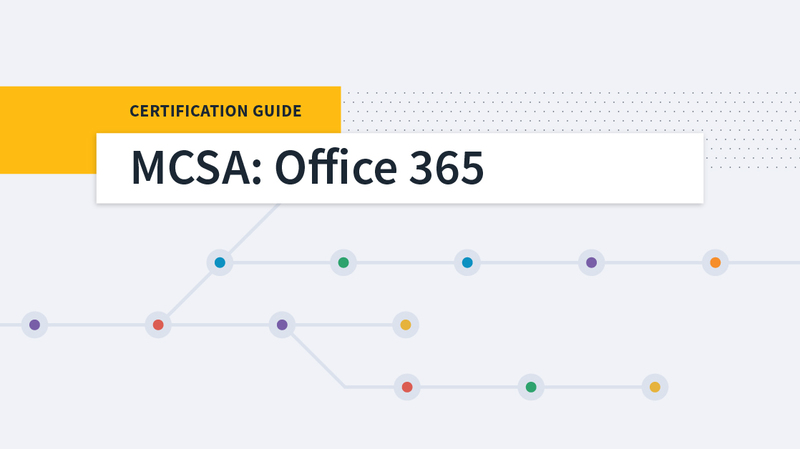 Typically, the MCSA: Office 365 certification qualifies learners to serve as software-as-a-service (SaaS) administrators or cloud applications administrators. Usually, these roles focus on managing Office 365 business productivity products such as Exchange, SharePoint, and Skype for Business. Microsoft certifications are laid out as a pyramid, with each level of certification leading learners to higher, more specialized, complex certifications. At the base of the Microsoft pyramid, IT professionals develop the foundation of knowledge with the MTA (Microsoft Technology Associate). The next level is the MCSA (Microsoft Certified Solutions Associate) and MCSD (Microsoft Certified Solutions Developer), which include many of the most popular certifications among IT professionals that are offered by Microsoft, including Server 2012, Office 365, and Azure. Finally, the MCSE (Microsoft Certified Solution Expert) represents the highest level of certification offered by Microsoft and provides learners the opportunity to develop specializations related to MCSA level content. As Microsoft describes it, the new MCSE and MCSD certifications (MCSE: Cloud Platform and Infrastructure, MCSE: Mobility, MCSE: Data Management and Analytics, MCSE: Productivity, and MCSD: AppBuilder) are aligned to Centers of Excellence, used by the Microsoft Partner Network to identify technical competencies that are widely recognizable by both Microsoft partners and customers. These credentials do not have a recertification requirement. Instead, the achievement date signals how you keep up with changes to the technology. Microsoft doesn’t require learners to renew MCSA certifications. However, renewing the certification is strongly encouraged. Technology constantly changes, so earning certifications demonstrates a commitment to keeping skills current, as well as a desire to learn. Each year, you have the opportunity to renew the certification by passing an exam from the list of electives, demonstrating your investment in broadening or deepening your skills in a given Center of Excellence. Each time you earn the certification, a new certification entry is added to your transcript. This process replaces the existing recertification requirement of taking a specific recertification exam every two years (MCSD) or every three years (MCSE) to prevent your certification from going inactive. Learn more about the new Microsoft certification structure. Begin exploring other Microsoft training and certification options to open up even more professional development opportunities. 70-347 – Enabling Office 365 Services. One distinct advantage of the MCSA: Office 365 is that it is an expedited pathway. Most MCSA certifications require three exams, but Office 365 requires just two exams. Learners pursuing this certification path should have some familiarity with Microsoft Windows Server operating system components (including DNS and IIS), Exchange, SharePoint, and Lync. The MCSA is considered an intermediate-level certification with no formal prerequisites, but learners should have 1-3 years of experience before beginning this certification path. Get started by reviewing the CBT Nuggets playlist for the MCSA Office 365. The following exam details are applicable for each exam that makes up the MCSA: Office 365 certification. Exam day logistics: On testing day, you’re required to bring two forms of original (no photocopies), valid (unexpired) IDs — one must be a primary ID (government-issued with name, photo, and signature) and one a secondary ID (with only name required). You will be provided with an erasable note board and marker that can be used during your exam. Most personal items, including cell phones, watches, and food and beverage, are not permitted in the testing center. Here’s a list of all prohibited items and other testing center rules. Skills measured: Each exam registration page on the Microsoft website provides a list of Skills Measured (free resource) to guide your study and preparation. *Microsoft does not publish the exact number of questions associated with its exams. Therefore, the number of questions a learner will see varies on a case-by-case basis. **Because the number of questions varies, it is not necessarily true that learners must earn a simple 70% to pass the exam. Microsoft exams have a reputation for being challenging. Many learners find they have to take an exam more than once to achieve a successful outcome. Fortunately, Microsoft is aware of the level of challenge associated with their exams, and often provides an Exam Replay, allowing learners to retake exams at a fraction of the cost. Please note that the Exam Replay may not always be available. As of this post’s publication date, each of the exams associated with the MCSA: Office 365 certification offers the option to include Exam Replay, but that may change. Learners should research Exam Replay availability to avoid missing out on the opportunity. Payscale.com provides a helpful salary guide to help learners determine appropriate pay scales for job opportunities associated with the MCSA: Office 365 certification. Depending on professional experience, learners that hold any MCSA certification can earn between $43,793 and $136,630. Roles for employees holding an MCSA: Office 365 certification include systems administrator, IT manager, IT director, network administrator, and more. Earning an MCSA is one of the first steps to launching a long-term, growth-oriented career in IT, and particularly, in cloud-based specialization. The MCSA is a lifetime certification that prepares learners to begin choosing areas of specialization that can equip them for high-wage and high-satisfaction roles. Propel your career by beginning your training for the MCSA: Office 365 today! Watch. Learn. Conquer the MCSA: Office 365!